It is recognized nowadays that a dog that is confined for long periods of time without stimulation, both mental and physical, can develop behavioural problems such as chewing of inappropriate items, digging and excessive vocalization, amongst others. Providing a large area for a dog “to run around in” is not enough, unless this area contains many interesting things to smell and to eat and to look at. Stimulation should involve all the dog’s senses. Feral or Village dogs spend about 80% of their waking hours hunting and scavenging for food. Domestic dogs have been helping and working alongside us for thousands of years, and most are bred for a specific purpose, such as hunting, farming or protection. For example, retrievers and pointers were bred to locate and fetch game and water birds. 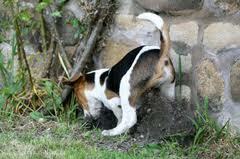 Scent hounds, like coonhounds and beagles, were bred to find rabbits, foxes and other small prey. Dogs like German shepherds, collies, cattle dogs and sheepdogs were bred to herd livestock. Whether dogs were working for us or scavenging on their own, their survival once depended on lots of exercise and problem solving, all in their quest for food. Do we provide all this for our pets? The common scenario for most dogs is that while we’re away at work all day, they sleep. When we come home, we serve them free food in a bowl—no effort required from them. They eat more calories than they can use. The result is dogs who are bored silly, often overweight and have too much energy. To alleviate this boredom and to get rid of all this excess energy, our pet dog will often indulge in totally unacceptable behaviour such as shredding the outdoor furniture (or even the indoor furniture if she’s confined indoors), tipping up the dustbin (guaranteed to keep her busy for hours), digging holes in a newly planted flower beds. Her welcome home behaviour will also be a little over the top because she’s so pleased that her boring, unproductive day has come to an end. If you spend a little time giving your dog “jobs” to do while you’re away, there will be no unpleasant surprises for you when you get home, and you will also have a calmer, more relaxed and “fulfilled” pet, without having to start taking up sheep or cattle herding, or hunting ducks and geese. 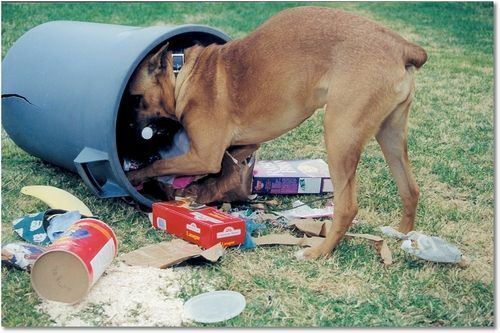 In my next post I’ll discuss some ways that you can keep your dog “busy” and happy.